Visit and feel the breathtaking North Shore of Kauai when you stay at this spectacular, spacious condo situated on the 8th Hole of the Celebrated Makai Golf Course! This immaculately clean corner garden unit with outdoor lanai on the golf course features immediate access to the World Class Makai Golf course, the elegant St. Regis Resort and all the unmatched beauty of the landscapes of the Hanalei Valley. As a ground floor corner unit, this is the largest available two bedroom suite in Emmalani Court and can sleep five (5) with Air Conditioning in the main living room and second bedroom. Enjoy all the amenities including a newly remodeled kitchen fully equipped for cooking for all tastes from pizza to gourmet, and the new flat screen TV, DVD's, wireless, phone with free long distance to the mainland and Canada, jacuzzi bath, beach toys, and golf clubs. The splendor of Kauai is within easy driving distance. Swim at the Number 1 beach in the USA, Hanalei Bay, a short 5 minute drive away. Snorkel at world class Tunnels, Annini, and Ke'e beaches, all within 10 to 20 minutes away. Or walk out our front door to Hideaways Beach, right next door or to our pool across the driveway! Hike the famous Na Pali Coast trail, 'Kalalau Trail', which is a 20 minute drive away at Ke'e Beach. Play tennis at one of two tennis clubs, the Princeville Tennis Club and the Hanalei Bay Tennis Club (just a five minute walk away). We are in a Wild Life and Bird Watchers' paradise -- walk out our garden door and see the Albatross (November through May) doing their elaborate courtship dance and nest sitting. The rare and elusive Hawaii state birds, the Nene geese, flock right outside our windows on the golf course. Kilaeua with it's bird sanctuary and National Wildlife Preserve is only minutes away. Between December and April the great whales swim twice daily right by the end of our cliffs. Special arrangements can be made for discounted rates on activities including golf, and whale watching all over the island. A booklet in the house provides the details and contact numbers. Enjoy Kauai, the Garden Isle of Hawaii with its plunging waterfalls, lacy streams and canyons - home to plants and birds that exist no where else. Kauai offers a unique island experience and our home in Princeville is the best place to enjoy it. We love Kauai and spend as much time as we can to enjoy the relaxation, the lovely smell of the flowers, and nature. We also like the special cardinals that visit the lanai to say "Good Morning". We like meeting our guests by telephone and getting to know them. Emmalani Court is known to have the best construction of all condos in Princeville. We had two purposes in mind - a place where we could spend 6 to 7 weeks a year, and one that had a warm and relaxing feeling to it. The size of the unit (1500 sqft) with the large windows and location favoring the trade winds achieved that objective. Princeville is also known for having the most moderate temperatures in Hawaii. We enjoy the walk to the St. Regis beach, the short hike to the snorkeling beach close by, and the whales off the shore during winter whale season. The association also sponsors various bbq's and get togethers for owners and guests. Across from the unit is the heated swimming pool and spa. 9 foot tall windows and patio open directly on the 8th hole of the Ocean Course of Makai golf Course. Off Living Room with table and chairs. Access to Golf Course. We could not have been more pleased or impressed with the quality of this condominium, or the thoughtfully kind way it was prepared. Everything is very clean, well-organized, and works as designed. We were impressed with not only all the standard amenities (such as enough towels & extra blankets, kitchenware, appliances, etc. ), but also the unexpected pleasantries (a lovely bottle of wine and chocolates -- thank you! -- beach chairs, boogie boards and other helpful beach items). We highly recommend this lovely condominium -- it definitely enhanced our trip! Thank you for a lovely stay! I had very good experience of my stay in the property. . Thank you for being our guest. We will be cleaning the carpets immediately now that we have been made aware of this problem. Our aim is to have a super clean home for our guests. Clean, spacious condo, great location. Perfect for our family of 4. We enjoyed the lovely pool, friendly neighbors, friendly patio birds. Walked to two beaches for swimming and snorkeling and to the St. Regis for gorgeous ambience and cocktails. Close to stores and sights. Overall, lovely vacation! My husband and I have stayed at this condo two times in the last few years, most recently in December 2012, and it can’t be beat. The complex is well laid out to be safe and quiet. I think because most people leave their windows open, they all know to be considerate of others. The condo itself is comfortably furnished, well maintained and very clean. The kitchen is fully-stocked with dishes, cutlery, appliances and a D/W, and there’s also a really handy W/D near the front door. It is surprisingly spacious and the floor plan is such that it accommodates a lot of people, but also provides separate areas for privacy and has a nice, covered patio overlooking the beautifully landscaped golf course. While there is A/C, you likely won’t need it. Gentle outdoor breezes and ceiling fans circulate air throughout. If it’s a rainy day or you just feel like staying in for a bit, there are a couple of TVs (including a big flat screen with cable in the LR), internet access and plenty of DVDs and books (including guide books) for entertainment. There’s also a small boom box for CDs. For food and other necessities, there’s a Foodland grocery store just a few minutes’ drive from the condo, at the entrance to Princeville. 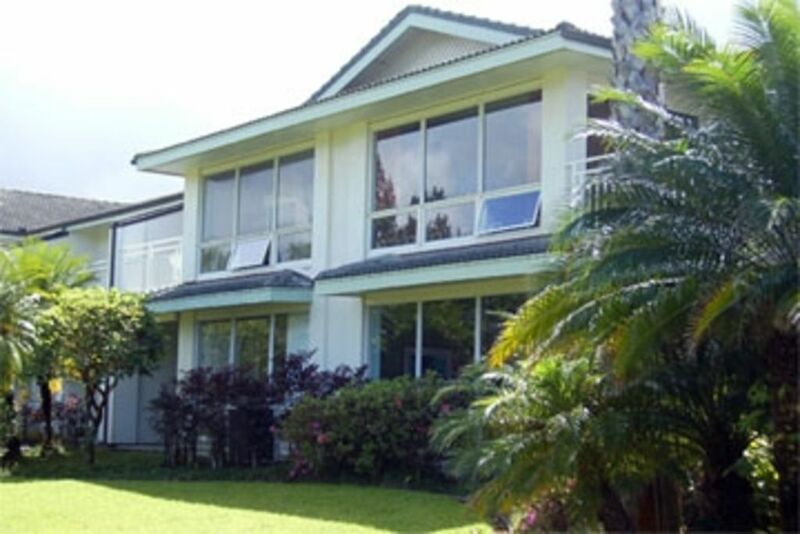 As great as the condo itself is its location— just a very short drive into Hanalei and convenient to all the north shore activities and attractions. Since Kauai is a fairly small island, other places like Kapa’a, Poipu and Waimea are easy drives for day trips. I almost don’t want to rate this gem so highly because it’ll make it harder to secure reservations. Having been there late spring and in the winter, I can say it’s the ideal place to stay year round: affordable, comfortable and convenient.